Anne's passion for the fabled Southwest landscapes of the Leaphorn and Chee detective series grew from a desire to be immersed in her "father's world, part real part imagined." The first chapter is devoted to Anne's relationship with her father who wanted to tell tales of a spectacular arid land and the Navajo holy people who live there. 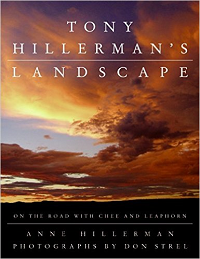 Subsequent sections are organized around Hillerman mystery novel titles, and feature book cover reproductions, quotes from the highlighted book, and panoramic vista photographs resplendently animated by Anne Hillerman's prosaic descriptions of Southwest regional topography, culture, politics, and history. Driving north in the direction of Shiprock "the Chuska mountains sprawl low to the west; volcanic plugs dot the horizon. Flocks of gray and off-white sheep melt into the landscape," Anne writes, expertly pulling the reader closer to cavernous, red rock intimacies.